Cornish Partnerships is a Cornwall based business networking company comprised of over 375 local businesses. This project required a directory listing solution with various functionalities including a user registration portal, a user accessible profile dashboard and payment gateway. When discussing the design of the website the client allowed us total autonomy but described his demographic and who he wanted the website to appeal to. We were then able to create a professional theme for the website using our functional specification and the clients checklist. 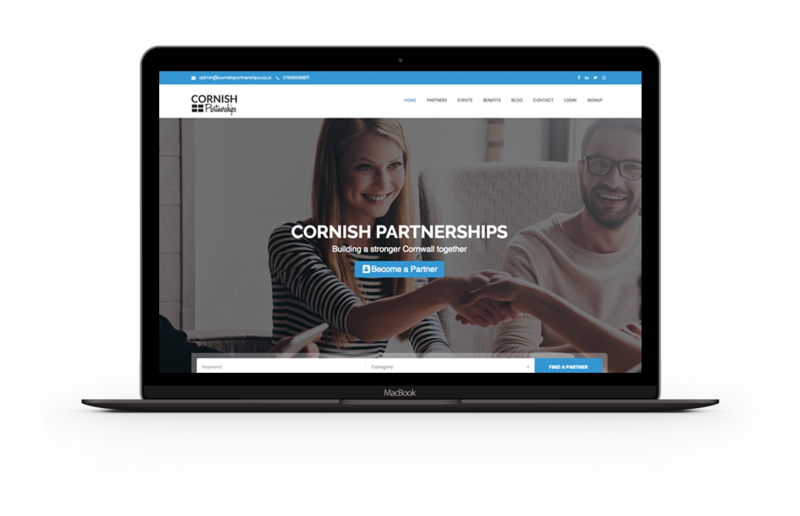 Cornish Partnerships has gone from strength to strength gaining over 375 partners in their first year of trading. From training on the CRM and support to scaling the business with new additions such as a “Sponsors” initiative and section, we have really enjoyed the first year supporting this business. We worked closely with the client throughout the first year offering suggestions and created various assets on the website as we identified new opportunities for the business. Cornish Partnerships is now one of the fastest growing business networking companies in the South West and we look forward to supporting them for many years to come.